Proposals that would boost diversity at the Football Association have been unanimously approved by the FA council. The reforms, which include increasing the number of women on the FA's board, will now go forward to the FA's annual general meeting on 18 May. The proposals require a 75% majority to be adopted. Heather Rabbatts is the only woman who sits on the FA board of 12 and chairman Greg Clarke had threatened to quit if the proposals were not approved. The FA council, which is made up of representatives from the Premier League, Football League and County FAs among others, meets to ratify proposals made by English football's governing body. The FA has proposed reducing its board from 12 to 10 members and increasing the number of women on it to three by 2018. 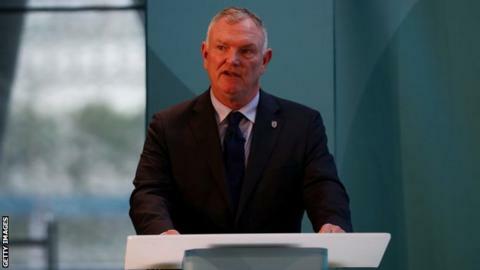 Nobody will be allowed to serve more than three terms of three years, and 11 new members will be added to the 120-strong FA Council "to ensure it better reflects the inclusive and diverse nature of English football". But the changes have been criticised by some as not going far enough. Anti-discrimination group Kick It Out said last month that the reforms were "a sham" that still failed to give sufficient representation to minority groups. Former FA chairman David Bernstein has said the football body risks missing an opportunity for real change and could end up with a "fudged compromise". Sports Minister Tracey Crouch warned in February that the FA was in danger of losing £30m of public funding and that legislation could be brought in to force change.